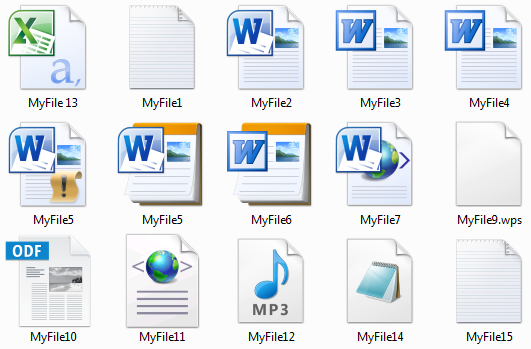 Translation Tribulations: The great guessing game: file extensions in Windows! I see 11 files - presuming 11 and 7 are both html and 5 is a docx. Looks like 13 to me. I venture to say nine. I also go for 10. Very astute, all of you! Looking at the picture I posted with fresh eyes, I would have said 13 myself, or at least 13. If you look very, very carefully at those icons, you can in fact see 13 distinct ones. But some of the differences, like those "W-squares" for various files that are somehow associated with Microsoft Word, are not necessarily noticeable in a quick inspection. People who work with various kinds of files often need more information than just a file icon, and that is part of the point I plan to make here. But I won't make the point at three o'clock in the morning. It's been an unexpectedly long day, so the video I planned to do as a follow-up to this will have to wait a little longer, but I will post the link to the answer(s) at the end of this comment. This contest was inspired by a recurring problem. Maybe some of you have guessed it already, probably a number of you have experienced it at some point. It's a very basic problem, and I am actually a bit surprised that in the year 2013 I am still encountering this problem about once a month on average, perhaps once every two months. And I think the reason that this still occurs is that the "gurus" and developers are often far too arrogant and condescending with the information they feel should be revealed to ordinary mortals, and they really don't think that dealing with little bits of stupid design and inconvenience are such a big deal. In fact, they are rather proud of their arcane knowledge, accumulated with great difficulty over many years. After some 41 years of fiddling about with IT, I have my own small collection of arcana, which I would happily trade for a good comic book collection for all I value it. These little details matter. They matter a lot. Whether the Gods of Microsoft thing so, and even when developers for whom I have the deepest respect think otherwise. They are little pebbles in our shoes, making an ordinary gait difficult. Or the wind-borne sand, blasting and wearing down the hardest rock grain by grain. Maybe we don't need more fancy features in the tools our work depends on. Maybe we need simplicity. Stability. And perhaps some easy, unobtrusive access to simple explanations without judgment when we need them. So for now, the contest is officially ended, and here is a link to the solution. One could probably say there are two correct answers to the challenge, depending on how one looks at it. I will discuss the reward with the winner tomorrow if time permits :-) Thank you very much, everyone! Start Windows Explorer (you can do this by opening up any folder). Thank you, Chris! Nothing wrong with XP, and in fact I fully intend to do a short video for XP when I have the time to put a screen recorder on one of my old machines. When I first had to do this under Windows 7, I was utterly baffled trying to find the settings exactly where you described. I'm almost afraid to ask what the situation is for Windows 8. "I'm almost afraid to ask what the situation is for Windows 8." The problems Microshaft have had with Version 8 remind me of a fun Xmas party a few years back including a friend who has an IQ rated at genius level. Believe me... We decided to have some fun with a new board game that nobody had played before. Reading the "manual" and going through everything even reduced this guy to confusion. But there is no conceivable way you can start any game like this without knowing what you are supposed to do to start it..."